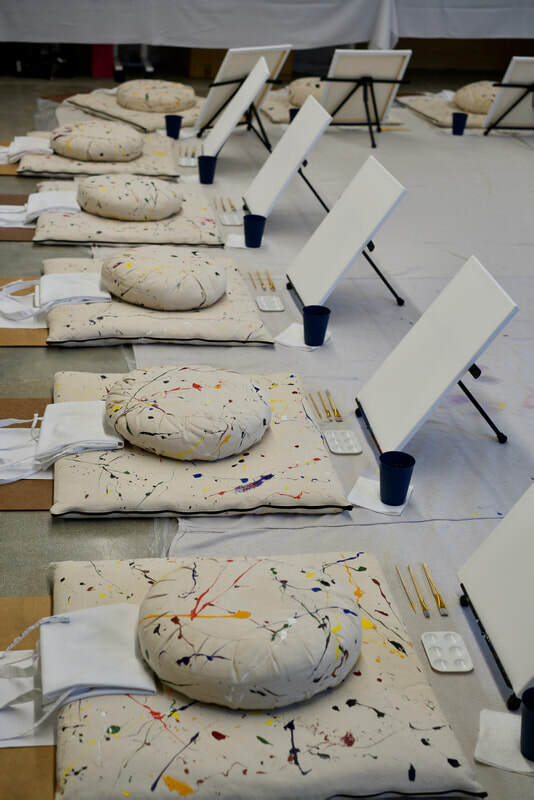 A drop-in meditation session meets a painting class. Our events are process-oriented (using artwork creation as a meditation) and do not require any artistic skills or experience. We guide people through each moment, while making sure there is enough time to free-paint from within. Publicly held classes tend to have ticket prices between $30-$45 per person, dependent on the location and the event. On rare occasions, we will offer events with a donation-based pricing model. Classes typically run 90 minutes, but can easily be altered. We have had 60 and 75 minute events too. Budget an hour and 15 minutes for set up. Our set up may take less time, but this is a safe estimate (depending on the size of the group). What supplies are provided? What do I get to keep? We provide all necessary supplies at no additional charge. This includes canvases, paint, brushes, meditation cushions (up to 25 participants), essential oils, incense, calming music, pens / drawing boards, paint trays, paint removing wipes, aprons, and two layers of tarps: one plastic, one canvas material to absorb drips/spills. We can bring up to 25 cushion sets, but are able to accommodate more participants with table-top set ups. Where do we hold the session? We have a beautiful shared space in Marina Del Rey available to us, but are primarily a traveling service and are happy to come to different offices, homes, corporate retreats or events!